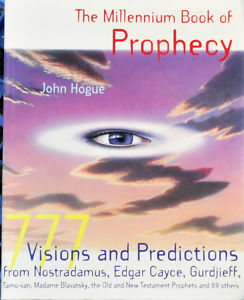 This is not only a book on prophecy, the design and book itself is a physical expression of prophecy. In 1993, I conceived and put this book together with the help of Australian designers at IKON Graphic Designs and produced by Ron Tanner through Byron Bay Media with the idea that it would look like a book from the future. We opened up margins and had the text interacting with hundreds of color illustrations in ways that were a full decade ahead of what you see today in web designs on the Internet. There are very few high quality copies of this out-of-print prophetic classic circulating in used bookstores because few people want to part with them. This deluxe, fully colored, avant garde illustrated book is the first edition of my Millennium Book of Prophecy that most of you may have seen in its text-only, second edition, click here. In the little white text-only version of that book you read me describe my update of the Four Horsemen of the Apocalypse as the Four Hellriders of Overpopulation, EarthTrauma, The Lemming Syndrome and The Third World’s War. In this first edition you will see my conceived illustrations of the Four Hellriders in full color and much more original art and photoshop illustrations quite ahead of their time. If you can manage a generous donation of $100.00 (if living in the US) or $120.00 (if living outside the US) or $130.00 (if living in Australia or New Zealand), I would like to give as a gift in return a personally addressed message with autograph on the fore page of this rare volume and much more. Reserve your personally autographed message and copy of Millennium Book of Prophecy now — and a downloaded copy of Predictions for 2012 in early December — by emailing me here. Hi john I love your website and I am just deciding what books to purchase.Ohhhh the choice 😉 I am particularly interested where you say human kind will be destroyed by an outer fire or transformed by an inner one.Wel I wrote this poem Dec 2013 after my Journey.I believe it was transformed by an inner one.This poem is in one of my books called ( Tick-Tock Boom Goes The Well) I also have another book (Destiny-tion Unkown)Each available on amazon kindle. I AM THE FIRE – I AM THE SUN – I AM THE HAPPY SPIRIT. I loved everyone but me,i done it for everyone even though the outcome was not there for me to see.I gave to all what i had taken from me.To win i had to redeem the fire so it was rightfully back with me.Now i am rewarded with light and sight i can clearly see and i trully love me.As long as i love me we will all be rewarded correctleee.They say charity begins at home so it begins with me.See love is me.Now to reward everyone i am donating my love back to myself all the love i gave away.I am full to the gunnels and bursting at the seams,i have all my love back so now i can start living my dreams.I gradually found myself deep with in yous,my love in yous have been my own guiding muse.I am love and love is me and now this i can clearly see.I give back to yous what was trully meant to be given,that is the air yous breath and now that i love me we are all happily living.So by thinking of me and using my 3rd eye to look within led to no more living in hell because my fire burned away all the sin.I had to find myself by thinking of only me because deep in the heart of it i am yous and yous are me.Evil has been banished now because for once i thought of only me.I trusted in myself,forgave all and gave myself love.And now i can trully love the one and only who is my one true love,my one true soul mate and he is me.I do trully love me and now i know he loves me we can live as one now and we will be set free.So yes i gave to recieve i gave him love so i recieved my own,now i love him i can enjoy my life and i have claimed the right to my thrown.Ohh really I AM good,I AM good at doing and by doing good good is what i have become.I AM not just good I AM the best,the best partner, daughter, sister, student, teacher and best ever mum.So out with the old and in with the new, everything you deserve will come to you. WHEN ONE DOOR CLOSES ANOTHER ONE OPENS,WHEN THERE IS A DEATH ITS FOLLOWED BY A BIRTH. By relighting the fire deep in my heart i burn out the fire thats been burning from the start.I know i was slow on finding me but i was just checking someone had my back and that i wasnt being blinded by light and the false love of the dark.So when all died and i redeemed what was mine i died too,now time for our birth to be started in heaven instead of this hellish zoo. Time has arrived and life has started again with the right fire burning,its re-lit in my heart to remember to always belief in love and stop the wheel turning. NOW EVIL IS DEAD BECAUSE I WON THE BATTLE SO WE WON THE WAR. So now we can all be at peace because i am wide awake,no sleep walking for us into the swampy muddy lake.I had to fight with myself to stop loving yous so i could love myself,so i could create the most perfect picture ever to place above the shelf.So now i love me we are all rewarded with love,so since the love is on me he can smile from above.Now that i have won i can claim my own prize which is seeing love and happiness in the worlds eyes.No more pain hurt sadness or tears in their eyes,because the fire is back with the devil who was in disguise.So dont you worry dont you worry child heaven is here with my original plan for you.Happy birthday everyone my dreams have came true and yes my dear love I AM coming for you.You are my precious gift and now i will give them theirs,i have created the most precious rebirth now that i have learned to listen to and answer my own prayers. Thanks. Use Firebox. I’ll check the problem with Chrome. i read your newsletter with great interest. You obviously have a gift. However you allow your politics to intrude too much in my opinion. I think you may be an upset Republican leaning reader. That ‘s OK. I’m a former Republican. I understand the pain. Understand also, that in my presidential predictions, documented since 1968 I am 11 and 0 and 7 of these accurately predicted Republicans winning the presidential election. I digress, but clicking on your link about a second holocaust (which did not bring me to any such article that i could find) with the implication that the Israelis desire this has led me to believe that you area latent anti-Semite. (Now i know the old joke about when’s the next bus due, however) your extolling the virtues of Wagner and attacking the Israeli foreign minister–who actually has not much power anyway–maybe he didn’t let you in to “his” nightclub once in Russia when he was a bouncer? First off, I gave you a link to the book where that piece on the Second Holocaust is embedded. I want you to read the whole book to get the whole answer. Now to Lieberman. I know Avigdor comprehensively, from bouncer to “pouncer” with missiles. I have studied him for years. He is an ugly man. I bare witness. I fear for Israel’s future with him holding some power over the Israeli people. Now to Wagner. Wagner is like Nietzsche. A misunderstood person. But his astrological makup makes him harder to understand than Nietzsche. N was compromised by being interpreted (like the Bible) out of context by his proto-Nazi sister. With Wagner his nettling personality traits are more difficult to understand, unless you have also been a medium for the beyond. The messenger is not the message. You can get caught in the foibles and human failings of the messenger and miss the message from the beyond that Wagner was sending. Wagner was a medium for the beyond and also a double Gemini. So the “message” sent by the messenger had multiple dimensions of high and low personality spicing it. If you don’t like the messenger, do not let that get in the way of the divine message Wagner sent to us in his music and his dramas. What he delivered was more vast than his little, egoistic self. It is a message bigger than yours or my egoistic self. Your understanding of the threat the mad Mullahs of Iran pose to the Israeli state is obviously inadequate. If you had read my work over the years you would know how I have slammed the Ayatollahs and Ahmadinejad as also apocalyptically mad. But let’s put them aside and look at your madness, Jonathan. The madness imposed by others. The madness that can’t see the short term memory working here to undermine “your” understanding, because your understanding is borrowed from others. It is a conditioned habit in the name of “understanding” that is programmed by identity to pick sides. Because it follows programmed ideas borrowed in your mind, imposed by society to make you think that you think for yourself and see what is going on free of filtering by this conditioning. You are under the hypnosis of conditioning that makes you identify with the Israeli side rather than be equally blind identifying by conditioned habits of others to myopically support the Iranian side. Your blindness supports Israeli supremacists. Other people’s blindness supports the Ayatollah and Ahmadinejad’s Iranian supremacists. My articles are a device to expose this madness and help you look beyond the Israeli and Iranian pathologies. Meditation can help. Anyway i still read yur thoughts as stimulating and food for thought for me. Now it is time to stop this stimulation of merely being entertained by what I write. My writing is the doorway to something far more important than opinions “for” and “against” people and nations in the news. Now it is time to go deeper. Time to go into meditation, Jonathan. I have left my invitation to go deeper at the end of this article. The choice is now yours, and if the time is right — go deeper with me than my words. many thanks for your thoughtful responses, which i only found by “chance” when using a search engine on myself, stimulated by an article about something totally different. I will absorb what you’ve told me. Thank you. Thanks for surfing the google wave to us, John.